A fairly challenging piece but well worth the effort for anyone with an interest in politics and social movements. The Shape of the Table takes place in a single meeting room, belonging to the communist government of an unnamed Eastern European nation. 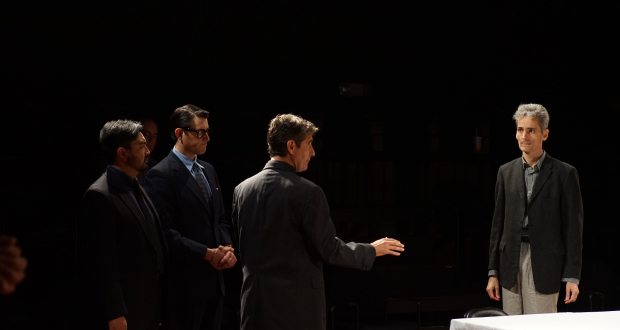 Set in 1989, the play follows the negotiations and power shifts taking place between the current party leaders and a group of pro-democracy campaigners. Strong ideas surrounding ‘power play’ and what it means to be in power run throughout the piece. At times leadership is shown in a favourable light and during other moments, it’s depicted almost like a form of imprisonment. Writer David Edgar makes an interesting decision in keeping the nation in question unnamed. This allows the audience to apply the themes to periods of real political history, depending on their interpretation. This technique was an effective tool in helping the audience at The Cockpit to truly invest in the action. 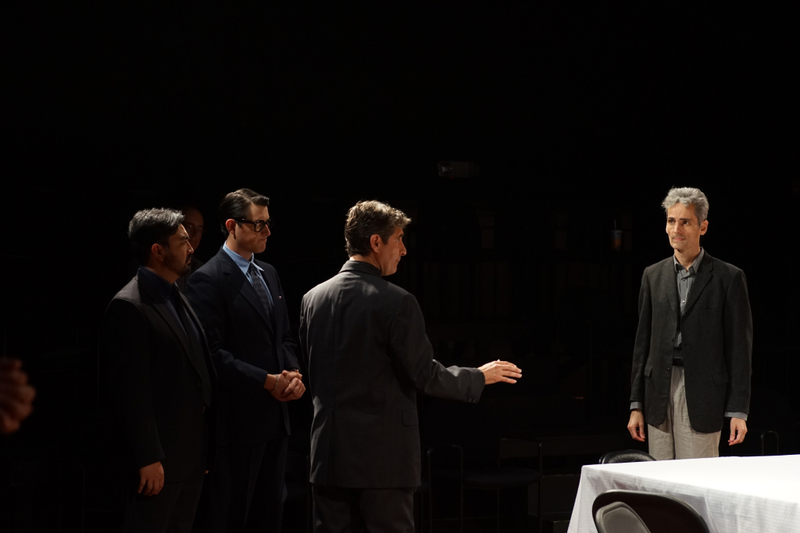 The 15-strong cast portray characters from a range of political positions, all experiencing a significant transformation of power during the play. Each and every character is strong and emotive and the cast do a noble job of delivering dialogue-heavy scenes with a tremendous amount passion and commitment. The journey of Pavel Prus (Brian Linden) in particular, is written, directed and performed in such a way that I could genuinely feel a powerful connection between character and audience. During this dramatization, Prus is already sitting on-set as the audience take their seats. This direction was key in having the audience connect with him from the beginning and rendered his transformation towards the end of the play, all the more effective. Edgar’s script is poignant, witty and at times quite funny. Although the language is intensely emotive, the characters often speak in long, elaborate sentences, which for me felt more theatrical than naturalistic. Whilst this could be a deliberate nod to carefully planned political dialogue, I personally found it quite challenging to follow for a play of this length. Due to the nature of the subject matter, each character is understandably tense and highly emotional throughout. Whilst this passion and drive is essential to portraying their situation, I feel the play might have benefited from a more varied tone. Likewise, the physical direction remains quite constant throughout. The scenes are based largely around dialogue with long periods of sitting, standing or walking around the one room. Whilst this does make some scenes a little more challenging to watch, I felt that director Jerome Davis used the confines of the space well, to not only build intensity but also draw attention to the physical power play between characters. In terms of production values, the set itself is quite simple. The title The Shape of the Table makes reference to talks held during the Vietnam war, when representatives took a very long time to decide on a seating plan, before actually beginning negotiations. In this production, the literal shape of the table holds its own significance but for the most part, the simplicity of the set succeeds in keeping the focus squarely on the conversations taking place. One chandelier is used alongside the stage lighting, to create moments of impact by fading or cutting quickly to black. 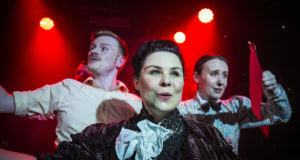 Perhaps the most interesting uses of sound and lighting are during a scene in which the cast sing in the dark and another where a set change is performed in low lighting and slow motion. These moments of more abstract creativity really stood out and were a welcome break from the gritty subject matter surrounding them. The Shape of the Table is a poignant, continually relevant piece, with strong political messages. 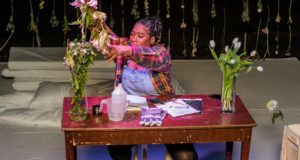 Funny in places and very direct in its tone, this play is not light entertainment, but will appeal to theatergoers with a knowledge of, or interest in, politics and social movements.